Today we will promote an awesome and actually free semi open-source app known as Mailspring. I doubt you have heard of it, it’s pretty new as it is a direct fork of the now defunct Nylas Mail. 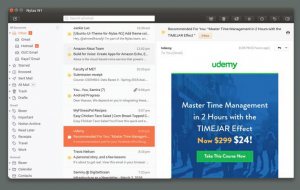 One of the core members of the Nylas Mail team decided to make a better a newer, faster and leaner free email client for Linux and Mailspring by all means, is just that. Let’s find out what else makes Mailspring a must download for you. What Is Mailspring For Ubuntu? Heavy dependencies have been removed and the package manager has been re-written for speed. Mailspring launches in a second. This is just the beginning. Mailspring isn’t VC funded and doesn’t need to make millions to succeed. Just a thousand paid subscriptions will make Mailspring a stable business and we have big ideas for the future of email. Understanding your contacts and customers is the key to connecting with them. Mailspring provides the context you need with enriched contact profiles featuring bio info, social profiles, location info, and more. Business happens in every language. Mailspring can translate messages written in English into Spanish, Russian, simplified Chinese, French, and German—right inside your draft. Read receipts, link tracking, and more. Mailspring auto-detects the language you’re using and spell checks for that language. No settings changes necessary. Typing common emails over and over is a drag—and when you send outreach that works, you want to reuse it. Mailspring’s quick reply templates let you create a library of customizable emails that are at your fingertips every time you send.